The price of this item is SGD 6.50 (about USD 5.10 / 394 yen). Oh well, the price is just SGD 3.50 (about USD 2.72 / 211 yen) so it's not fair to complain a lot on "Hot Wheels", we get what we pay, simple as that. 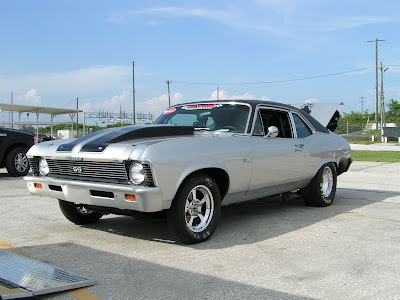 Chevrolet Nova (also known as Chevrolet Chevy II) is a compact automobile manufactured by the Chevrolet division of General Motors produced in four generations for the 1962 through 1979 model years. Nova was the top model in the Chevy II lineup through 1968. The Chevy II nameplate was dropped, Nova becoming the nameplate for the 1969 through 1979 models. Built on the X-body platform, the Nova was replaced by the 1980 Chevrolet Citation introduced in the spring of 1979. The Nova nameplate returned in 1985, produced through 1988 as a NUMMI manufactured, subcompact based on the front wheel drive, Japan home-based Toyota Sprinter. Note: I do not claim any rights on the above image. All rights and credits belong to the owner. The image are used as a reference material only and not for commercial purpose. I know a blogger who is very much into collectible cars and would like to introduce his blog. Thanks a lot Dennis, you are a nice guy. I will visit his blog for sure. Have a nice day.